Here’s an early Christmas present for all of you: a pair of archive files that each contain 90 minutes of somewhat innocuous holiday music. The real bonus, though, is hidden in the recordings: between the usual bits of Nat King Cole, Kenny G, and 101 Strings are little snippets of Chicago media history. FM100 was the primary Beautiful Music station in Chicago (under its various ownerships) from the early 1950s through the late 1980s, and their format consisted of soft instrumental versions of pop songs with the occasional light vocal. The attached recording is very typical of what FM100 sounded like– just replace the Christmas tunes with non-holiday songs by the same artists. You’ll also hear a couple of weather forecasts, and learn how it was a very cold night that Christmas Eve. WNUA was a Smooth Jazz station from the late 1980s through the late 2000s. It’s not coincidental that FM100′s demise came around the time of WNUA’s rise: they both served the purpose of providing background music. Beautiful Music formats were being dropped all over the country at that time, and WNUA’s brand of ”Smooth Rock, Smooth Jazz” was just a little more hip and rhythmic (and less sleep-inducing). The recording presented here isn’t quite representative of the typical WNUA broadcast day: they went a lot softer here, plus they interspersed audio snippets by on- and off-air staff and their families. They also included station jingles that sound like ringing bells, with a little “hourly chime” effect at the top of each hour. You still get Kenny G, though. Just download each file, unzip, and load the resulting MP3s into your favorite music player. There are two MP3s in each archive. Download and enjoy– and maybe you’ll blow the mind of someone who actually remembers these stations. I’ve recently become a source of amusement to my lovely wife. I suppose in some ways I’ve always amused her, but lately she’s been cracking up over my reaction to a series of TV commercials. We keep running across half-hour infomercials for those Time-Life music collections: you know them– a has-been musical celebrity like Tony Orlando talks to a host with a fakey name like “Chelsea Applestone” about a collection of CDs containing 168 Awesome Soft Rock Hits! or 138 Romantic Classics! The infomercial splits its time between the hosts’ reading cue cards, comments by more fakey-named people talking to someone off-camera about how super it is to have all these songs in one place, and of course, clips of all the fabulous songs on the collection. 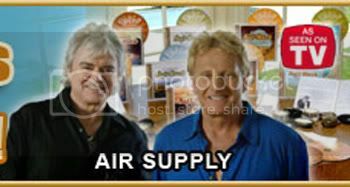 About a minute into the commercial I usually start wondering aloud if the guys from Air Supply actually live in a place that looks identical to the set they’re sitting in or if Huey Lewis was hitting on Valerie Springbutton between takes of the “Superstars of the 80s” spot. And then there’s the music, but I don’t really need to explain my opinions on “She Believes in Me” or “Ride Like the Wind,” do I? All that said, here’s my take on these collections: you don’t have to actually buy the CD sets, you can simply watch the commercials. Why? Because nobody really needs to hear all these songs in their complete form. A memory is like the flash of a camera– it comes quickly, you’re in the moment, and then it’s gone. The absolute perfection of these commercials is the fact that in 30 minutes you can be taken back to a period in your life when these songs meant something to you, and then it’s back to the remote and The Colbert Report. Case in point: during one of these commercials, they played a clip of Boston’s “More Than a Feeling;” the memory that flashed through my head had me driving in my 1974 SuperBeetle to my friend Craig’s house on a bright Saturday morning in May during my senior year of high school. We hung out in his driveway and then went out for Italian Beef sandwiches. All of that was evoked from fewer than 5 seconds of a Boston song. Would I have recalled more if I heard the rest of the song? Probably not. My advice: save the $150 and TiVo the commercials. The bonus is that nobody will ever hassle you for actually buying an “As Seen on TV” CD collection. Meanwhile, Lisa continues to laugh while I play the grumpy old man who’s cursing out the TV. I think she thinks it’s cute that I’m getting old and cantankerous. Maybe I am. Over the years, I’ve made an observation about the music they play at my health club. Depending on the time of day and where in the gym you’re working out, you’ll hear a different music stream running. For example, the locker rooms always seem to have the Soccer-Mom music channel on: you know, “Sunny Came Home,” “Chariot,” and Fergie’s “Big Girls Don’t Cry.” The Heavy-Plate-Lifting area, home of the more hard-core weight training, always has heavier fare by bands like Staind and Red Hot Chili Peppers. The main workout area, though, has different music depending on the time of day. All that said, I’ve come to the realization that Saturday and Sunday mornings have been designated “Old Fogey Classic Rock Time.” In other words, I think they’re gearing towards my demographic. In other words, the music they play is so familiar to me that it’s almost like listening to Ray Conniff, Percy Faith, or, dare I say it, Roger Whittaker. In fact, I may go so far as to submit that Classic Rock is to my generation what “Beautiful Music” was to my parents’: something so innocuous that you don’t even realize it’s there. 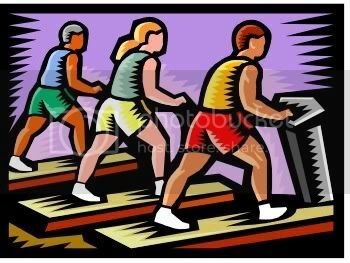 I have to tell you, though, it’s not at all motivating to be doing chest presses while listening to “Brain Damage” by Pink Floyd. The funny thing, though, is that my kids know a lot of these songs thanks to Guitar Hero. So these songs are already reeeeeeeaallly familiar to them, too. Liz Phair has a new album out. And on the cover she’s looking down her nose again. Frankly, I’ve seen enough of this lady’s nostrils and upper lip for one lifetime. Yesterday, some guy (I’m guessing between the ages of 18 and 22) was waiting at the train station with the rest of us morning commuters. He had a set of earbuds on, which is not noteworthy in itself, and he was playing his music pretty loudly so many of us could hear it– again, nothing out of the ordinary. What makes this worth mentioning is the fact that he was listening to “Hollaback Girl.” “Hollaback Girl,” dude. Nobody over the age of 16 should even be listening to that song, let alone blasting it in his earbuds loud enough for everyone else to hear it at seven in the morning. Maybe I should have offered to download “Iron Man” to his music player. This is a tough blog entry to write because I could go on for days about Christmas songs that belong on The Dark One’s player. I’ll try to restrain myself, though. The other day, we were at Pottery Barn and were subjected to the most God-awful rendition of holiday “music” I’ve ever heard. Some idiot took vocal clips from people like Bing Crosby and made “loops” of them and then lay them over a cheesy drum machine. The abomination that really burned me up was the version of “Happy Holiday” that seemed to go on for a half an hour. If Pottery Barn wanted customers to leave the store quickly, that’s the way to do it– just like one of those ultrasonic pest remover things you plug in. I don’t know if they’re selling a CD of this stuff, but if you even consider buying it, shame on you. And the ghost of Jimmy Hardy will visit and haunt you until you change your ways. Now, I could continue this entry with complaints about Madonna’s horrible cover of “Santa Baby” or the Singing Dogs or Paul McCartney’s “Wonderful Christmastime” being firmly entrenched in the top 5 of Satan’s favorites, but since it’s the holiday season I’m going to switch gears for a minute. Give the Red Dude a break, you know? For some reason, this seems to be the year that decent Christmas songs are popping up. There are at least two new (well, new to me) versions of Roy Wood’s “I Wish It Could Be Christmas Everyday” in regular rotation on stores’ overhead music systems, which is great. I’ve also heard Slade’s “Merry Xmas Everybody,” Mud’s “Lonely This Christmas,” and Chris Rea’s “Driving Home For Christmas” a few times in the past few weeks– all great songs that get a lot of play in Europe and the UK, but you never hear them here. Yay to whoever is picking up on these songs! One song that would probably make Satan’s iPod and is still redeeming in a non-Happy Holidays way is “Fairytale of New York” by The Pogues with Kirsty MacColl. The lyrics are on the next page, but they’re not for the faint of heart. I laugh whenever my local Irish pub owner, Derek, plays this on the PA because I don’t think the customers catch the lyrics. It’s The Pogues, after all, so don’t expect something shiny and happy. Finally, I’ve seen the term “Satan’s iPod” starting to crop up around the internet lately. If this is my little contribution to popular culture, then enjoy it with my compliments. The Chicago Tribune printed an article last Sunday about the worst songs ever performed by karaoke singers. That said, here’s the list and my comments. The ‘net has been abuzz with the recent articles in Blender magazine listing the 50 Worst Bands and Songs of All Time. Now, some of these songs would appear by default on Hell’s Muzak System (which I envision as a less reprehensible version of Satan’s iPod) based on their mediocrity or plain stupidity. The Red One’s iPod consists of tracks that are intrinsically evil. But let’s not let this opportunity pass us by. Here’s a link to an article that has the complete list, and the next page has my reading on the list. Today I want to mention the songs that will appear in the “Soundtracks” section of Satan’s iPod. You’ll know ‘em. “Respect” by Aretha Franklin. Every single time there’s a scene in a movie where a woman gets the upper hand over some idiot male in her life (the one that comes to mind is Bridget Jones’ Diary) they play this song. Knock it off. “I Feel Good” by James Brown. I honestly wonder if anyone who makes commercials, TV shows, or movies actually watches commercials, TV shows, or movies. (Scene in an ad agency’s office: “Hmm, we need a song to put in this commercial for our new conditioner/air freshener/dog food..” “Hey, I got it! What about that ‘I Feel Good’ song?” “Brilliant! Nobody’s used that before! !” ) I hope the Godfather of Soul is getting a little piece of the royalties for this. It has to be the most overused song in advertising and entertainment history. “Old Time Rock and Roll” by Bob Seger. You know, Risky Business was an okay movie. You had Tom Cruise when he showed promise, Rebecca De Mornay being, well, Rebecca De Mornay, and that kid who played Burt Viola on Moonlighting. Oh, and that “Balki” guy. The scene with Tom dancing to this song was mildly funny the first time we all saw it. Since then, it’s inexplicably become part of the pop culture landscape, and it’s been reenacted by everyone from Ron Reagan Jr. (in a Saturday Night Live skit that was actually funnier than the original movie scene) to this really stupid-looking Garfield movie that’s coming out soon. Again, the movie and TV people aren’t watching movies and TV. No more, please. Finally, please– no more usage and/or remakes of Blondie’s “One Way or Another” and for that matter, The Romantics’ “What I Like About You.” These songs seem to keep popping up in the waves of Amanda Bynes/Hilary Duff/Lindsey Lohan movies for the ‘tweeners. And as the dad of two girls at whom these movies are targeted, I get to hear this stuff more than I oughta. Lately, I seem to be hearing a lot of songs that grate on my nerves. I mean, really grate on my nerves. They seem to pop up all over the place– radio, TV, in stores, in the car next to me with the nasty subwoofer… but mostly at my health club when I’m working out. Now, it would seem the simplest thing for me to do would be to put on a set of headphones, but where’s the fun in that? I would much rather gather up some good aggravation and share it with you fine folks. Ladies and Gentlemen, I give you Satan’s iPod. The idea is this: these are the songs that The Red One has on his Fire-Engine Red 100 GB iPod (coming soon from Apple), and should you find yourself on The Road to Perdition, these are the tunes that await you. I’m going to try to stay away from the obvious, such as “Disco Jesus” by Tammy Faye Bakker or Dan Blocker’s “Happy Christmas On The Ponderosa.” Songs like this are already in the capable hands of Jim Nayder and his Annoying Music Show. And I know I will offend some of you with my tastes. But too bad for you; this is my blog. - “The Picture” by Sheryl Crow and Kid Rock. Keep the sharp objects away when you hear this song. This takes the honor of being the only song more depressing than “Reflections of My Life” by Marmalade, and I actually like that song. I know that country music is stereotyped as being all bummer stuff, but this is almost a country Spinal Tap song. Watch the blog for more entries.